So anyway here is a lost hat. It’s bright red and hanging in a bush on Garstang Road. Seems utterly preposterous on what must be one of the hottest days we’ve had of late, that someone should have been wearing a hat. But then little heads. I saw a 2 week old baby today at Blackpool Zoo. I almost can’t remember my son being so small yet he’s still my baby. It’s such an idyllic day thay I can’t help but marvel at the beauty of these small people. And they are people. We sometimes fail to give them credit for what they know. This morning a 3 year old identified a classic Porsche 911 for me in a classic car magazine…..before going on to tell me that his favourite car is an Ambassador! Anyway if anyone has dropped said hat……it’s on a busy outside a care home in Fulwood on the A6! It’s a favourite haunt of ours. A man made lake next to the beach just round the corner from Lytham. The cafe serves immense home made fish fingers and all manner of butties, cakes and main meals….a real delight especially if, like us, you have a small child. The playground is great and if you’re really lucky there’s a guy with a huge inflatable slide…..more fun! I don’t know about other parents but my son has had four new pairs of gloves or mittens this winter with three pairs left over from last winter. To date I have 5 orphans and a lost pair. Most losses seem to happen at nursery. How? I just don’t get it but next winter I’ll be making his! Up there with knitted trunks, I’m sure, the threat of home made will encourage him not to lose them! I’m not up to making shoes, though! It’s so long since I blogged that I’ve forgotten how to put a caption on photos, suffice to say I was never someone who really noted objects….it was always about the garments or shoes….but couldn’t resist the doggy. I’m officially soft since having a child. Also pink mittens for toddlers are clearly all the rage….not much choice if you have a baby girl. I’m glad I had a little boy – I think the pink overkill would have had me reaching for a Dylon subscription by now! I captured this at Blackpool Zoo…and I love it. It was floating in the penguin pool. Seriously visit Blackpool Zoo. The last time we went was not great. I wasn’t at all pleased, but this time I was heartened, not least by the excellent sea lion demo. The keeper/trainer was fabulous, informative, passionate and encouraging us all to realise that predators are really no threat to animals….we are. He also had an angle on the SeaWorld debacle which came as a total surprise. Despite our global, mutual outrage over Shamu, I had never realised there was a positive side to SeaWorld, at all. Let’s all strive to be kinder to all living things in 2017. 2016 was a nasty blight on us all. It’s interesting that this piece was written back in the summer….and we were only hal;f way through the year. Pre trump, pre more celebrity deaths, pre countless more attrocities. I wish you health, love and happiness for 2017. This delightful shot was sent to me by Robin Gregson. 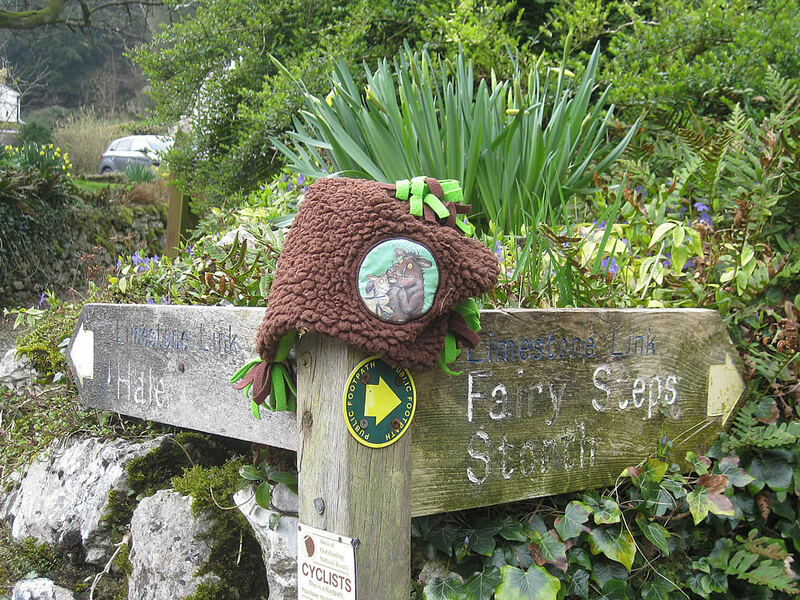 I don’t know what I love more about it, whether or not it’s the actual hat and the marvellous Gruffalo, or the fact that it’s on a footpath sign directing you towards the Fairy Steps – how magical. It makes sense. Among Robin’s many talents, he has just published his first novel Unreliable Histories. I was zooming through it on holiday, got 3/4 of the way through and I just don’t know where time has gone recently but I’ve not finished it, still! Definitely worth a download, I’m enjoying it enormously….and not because he’s a mate and I’d have to say that (wouldn’t I? ), but because it is rich in language, humour and plot. I’m also looking forward to reading the Gruffalo to my young son, who, thankfully, adores books. It doesn’t matter if we’re reading That’s Not My Penguin or Peppa’s Viaje En Tren (I’m not kidding), he’s enthralled. I hope it lasts. Sadly pregnancy and motherhood have not done much for my joy of reading, I don’t seem to have the attention span any more so it’s been a real thrill to read Robin’s first novel without, unrelatedly, having to put it down and pick up Closer magazine instead…..I never said I didn’t have a shallow side! As for Beetham and The Fairy Steps, I’ve not visited myself but it looks lovely and like a walk the kids might enjoy, if only for the challenge of climbing the steps without touching the walls! I’ve walked round Moor Park a number of times since William was born, probably more so than during the preceding 46 years! 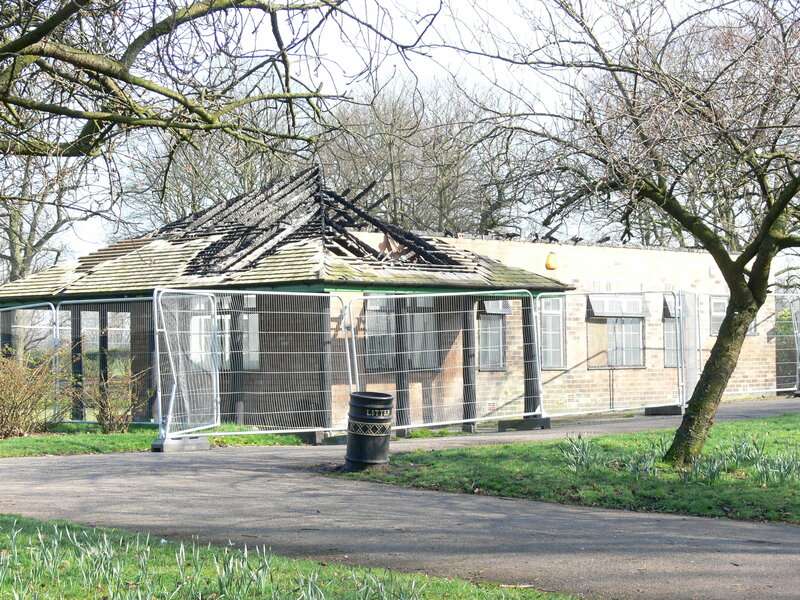 It’s a lovely park which skirts a very beautiful avenue, once home to Preston’s super rich, I imagine, yet now home to consultants’ surgeries, Moor Park High School and Preston College’s annexe, The Park School. 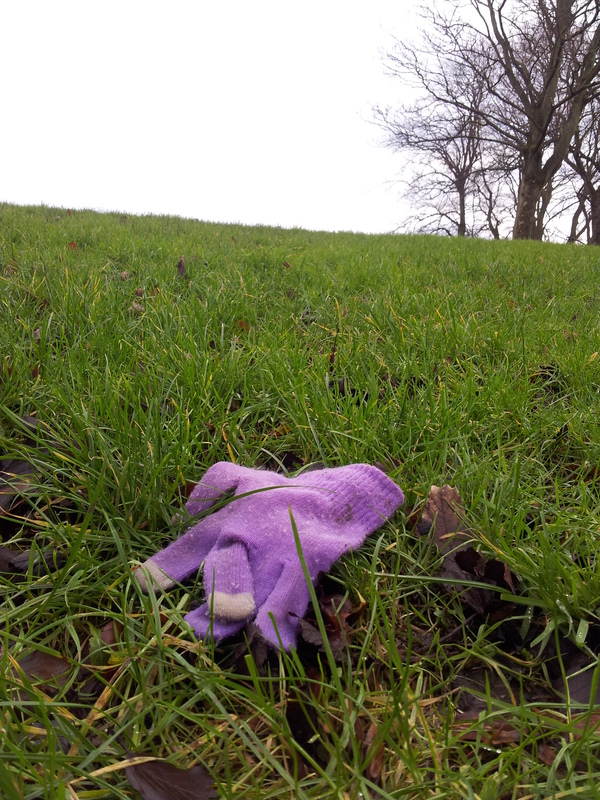 I spotted this purple hand…. 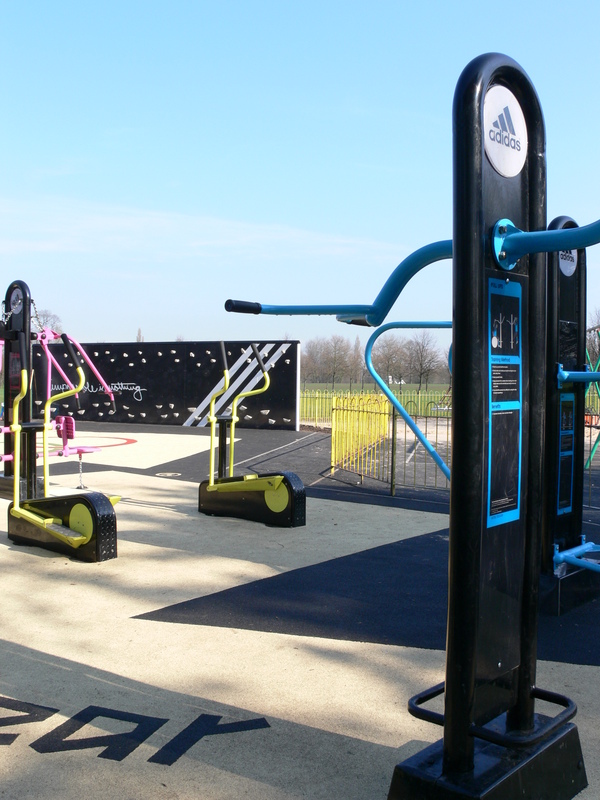 The park has always been a happy place for me although when I once had a personal trainer and was learning how to run, it became a source of discomfort….no loos! There are two public conveniences but both locked following increasing incidences of illegal naughties going on….now, however, some genius has installed one of those all encompassing blocks near the bowling greens – relief! ……..but they have rebuilt and as I say, installed some new pay as you go loos – oh the relief! 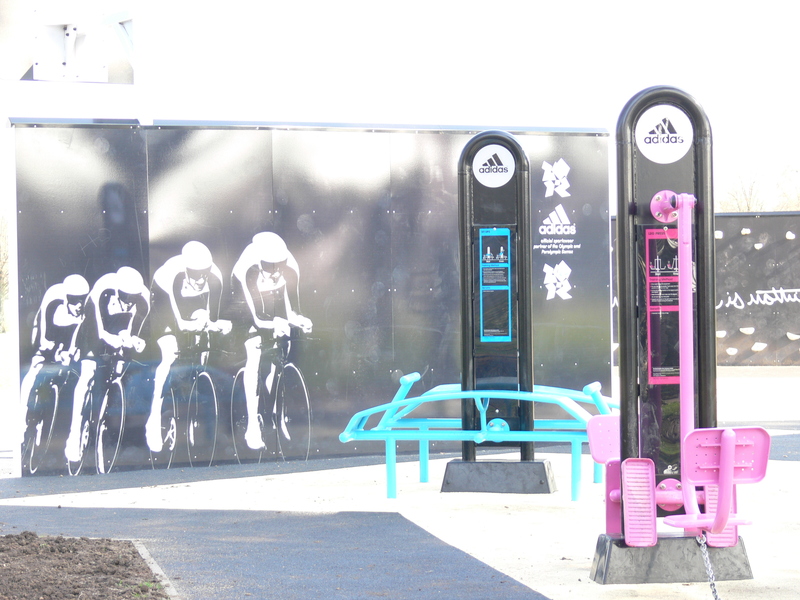 They also have one of those Adidas sponsored exercise areas. I’d be lying if I said I didn’t like these areas. They remind me so much of the ones you get on the beaches in Spain…so, of course, remind me of being in Spain. I missed it so much last year, choosing not to fly whilst pregnant, but can’t wait to get back there this year to the lovely villa. Moor Park is a lovely place to walk round, you can play tennis, bowls, take a cycling tour, care of a Council initiative, feed the ducks on the pond…or just have a nice sit down. There’s also an observatory and it breaks my heart to know that it is no longer in use. I would dream of looking up at the stars from there when I was a child and the minute I became an adult, they shut it down and stopped the public viewings. TYPICAL. Someone get Dara O’Briain and Brian Cox on the case! There’s a car park at the Preston North End end of the park so no excuses for not giving it a whirl – best in the summer and autumn months!